Dominic Ryan looks ahead to Leinster’s tricky trip to face the Dragons this Friday. Ryan in training this week. 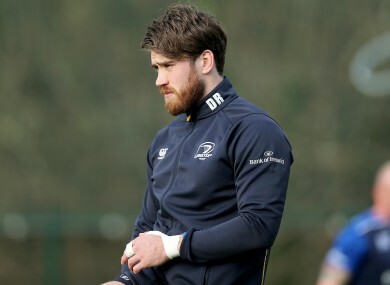 TWELVE MONTHS AGO, Dominic Ryan was part of Joe Schmidt’s extended squad for Ireland’s Six Nations campaign but now he’s determined to return to those levels by helping Leinster retrieve their season. The flanker, who made his international debut against Georgia in November 2014, heads into the next set of fixtures knowing he has the opportunity to make an impression on the Pro12 stage. With 16 players away on international duty, Leo Cullen brings a severely-depleted squad to Wales to face Dragons on Friday evening as the province look to get back to winning ways as the league campaign resumes. Ryan started the record 51-10 defeat to Wasps last time out and admits it was a humbling experience. “As far as I can remember, personally, that’s the biggest defeat I’ve been involved in with Leinster and it’s not a good thing but look there’s no point dwelling on it something like that,” he said. “While it’s easy to sweep it under the carpet and move on, if you look at our form in the games leading into that we were going quite well so it’s important to focus on that and not the bad form at the weekend. Although Cullen will have to make do without as many as 35 players at the weekend, Leinster will be targeting the forthcoming period to consolidate their position in the playoff berths. Before the final two round of games in the Champions Cup, the province had embarked on a seven game winning run which saw them surge up the standings into second. And Ryan acknowledges the importance of maintaining that winning momentum during the Six Nations window. “These Six Nations games, except last season, if you look at the two previous seasons we got 18 or 19 points out of 20 which if you look back on last season that was the difference when last year we got, I don’t know, eight out of 20 maybe. “We always say as a group this is the big time of the year and you can tell what position the club is in after these fixtures. “We realised Europe was over after December and those two games were just about building for the future in terms of youth and putting a roll together but it didn’t go very well last weekend. “Are only thing now is the league and we have to put everything we have into the league and we’ll treat it more seriously this weekend than we did last. Leinster sit one point behind leaders Scarlets ahead of their trip to Rodney Parade. It’s never an easy venue to go, particularly when Dragons, sitting 11th in the table, will be missing just three players to international duty. “It is important we don’t get too down from last weekend and there will probably be a number of different bodies this week with the international stuff,” Ryan added. “We got beaten by 10 points over there last year and they beat Munster quite well this year so it’s a tricky place to go, they’re always a tough side and only have three internationals away with Wales. Email “'We have to put everything into the league now and we've been eyeing this game up for a while' ”. Feedback on “'We have to put everything into the league now and we've been eyeing this game up for a while' ”.